Thousands of men and women of all ages worldwide have discovered the benefit of Hair Envy’s Technology for the improvement of the appearance of their hair. Here are just a few of our customers that have achieved exciting and remarkable results. I would like to take this opportunity to provide you my feedback for the hair envy program. I have noticed so much new growth on the top of the head and in the front and sides in ONLY 3 WEEKS. I experienced so many programs in the past and have never seen this type of result. I have used other laser light therapy programs with use of many products that show minimal results. I am so excited about my results that I have actually referred 2 of my friends to the location for starting their program. Hair Loss is experienced by so many men and women for so many different reasons. This can be a very horrible situation for so many of us. I am of the belief that we need to share our results since so many people are fearful that there are no solutions that really work. 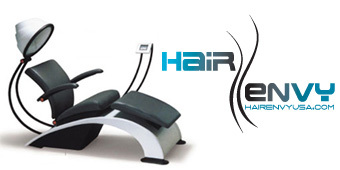 I am writing my testimonial on the Hair Envy USA SYSTEM because this program WORKS. At the end of the day you have nothing to lose but everything to GAIN by starting your program today and find a chair in your local area and begin experiencing the excitement that I have seen in growing new hair. This is not a program that wants you to sign up and spend lots of money that show GUARANTEED RESULTS and you pay for something that does not work. I would invite anyone that reads my testimonial to not wait one more minute to find a chair to begin seeing the immediate results that I have experienced. - 58 year old female. I had worried about hair loss since my early thirties when I saw the enormous amount of hair loss suffered by my. I watched my own hair very closely and began to see the “dreaded scalp effect? very clearly in my early fifties. I have been using the CTG for almost four years and the results are truly startling. When I look at my hair now I am not reminded of my poor, dear mother in her later years, but rather as I remember her when I was growing up - with a full head of beautiful blond hair. And - incidentally - many others have commented on the absolute radiance and fullness of my hair now versus just four and five years ago - the feeling from those unsolicited comments is quit exhilarating. I am ever so thankful for CTG and I wish every woman had the opportunity to see the difference. I lost a lot hair in the front and on the sides in my late twenties. My hair loss then seemed to stabilize for the next twenty years or so. Then in my early fifties the hair on the top and back of my head started going too! In fact, I fully expected to be bald by the time I was sixty. Well, that didn’t happen. In fact, here I am almost sixty and the outcome is really quite amusing. My friends who were losing hair at the same rate I was are now wearing hats all the time or shaving their heads while claiming not to care about their vanished hair. I know that is a total lie because those same guys were always combing and primping when caught unawares. I believe and am certain that is only because of CTG. Ironically, when I started the CTG sessions I had a high degree of hope and expectation that I would see a return to the ‘glory days‘ of my youth, but I didn’t see any difference for several months. Finally, after about five or six months friends started to notice the difference which I had missed entirely. That’s easy to understand because while I had not seen any difference in the front, the back and top of my head had really changed. The circle of scalp at the back of my head was no longer visible and the hair on the top of my head was much thicker! In fact, the comments of friends (who thought I had gotten an implant or something) prompted me to go back over old photos and the evidence was there clear as a bell. While there was little change in the front the top and back had looked totally different - almost as it had looked in my thirties. For me CTG has been truly miraculous. And, even today I still see incremental improvement in front. So, overall its been great and I am still using CTG and will continue to. As a child I was always known for having a thick full head of hair. This carried out my entire childhood as the stylist would actually thin out my hair with thinning scissors as my hair was so thick. However in my early twenties the appearance of my hair started to decline. In my search to find a solution to improve the appearance of my thinning hair I came across products and solutions that had both toxins and risks that I was not comfortable with not to mention a mix bag of questionable results. Upon learning about Hair Envy’s technology I quickly realized that this was not a solution but the only solution that truly improves the appearance of thinning hair. After only five months the appearance of my hair has improved dramatically. My confidence is back and I am confident that the appearance of my hair will only continue to improve in the next few months. Thank you Hair Envy!! !